Finance Jobs in Asia going back to boom time? HONG KONG — Marco Wong lost his job with Citigroup in Singapore in mid-January. During all the turmoil that engulfed the financial world last year, the cutbacks at the U.S. banking giant were neither unique nor surprising. But 20 job applications, four interviews and three and a half months later, Mr. Wong was again gainfully employed — as a financial consultant at IPP Financial Advisors in Hong Kong. Asia has already emerged more forcefully from recession than the United States and Europe, economic reports over the past month have shown. Now, that upturn here is starting — at least tentatively and in certain sectors — to feed into the job market. Hiring is starting to pick up again, recruiters and bankers say. Broad unemployment is still rising, a normal pattern even after economies begin to emerge from recession. But economists say that any early signs of job growth are a prerequisite for a more solid-based recovery — one in which more confident consumers, and not just huge government stimulus packages, can play a role in lifting the economy. Perhaps the most striking element in the new hiring: Almost a year after Lehman Brothers folded — roiling financial markets, spurring a remake of the banking landscape and feeding one of the worst recessions in modern history — it is the financial sector that is leading the way. “Things have picked up here — unlike in Europe and the U.S., where that’s absolutely not the case,” he added. To be sure, the recovery in Asia is tenuous, and highly dependent on a recovery in the West, a major market for the region’s export-driven economies. But for now, the picture is brightening. Jerry Gunnell, a corporate cash management specialist in Singapore, fell victim to Bank of America’s headcount reductions in February. He is now back in the saddle at Standard Chartered, a British bank that does much of its business in Asia, in a somewhat different but equally senior position he took up in mid-June, also in Singapore. In the past month, several banks have announced plans for some serious hiring in Asia. Standard Chartered intends to hire about 850 relationship managers for its consumer banking business over the next 18 months, to gain a larger market share of affluent customers in Asia. HSBC — which, like Standard Chartered, is very active in Asia — is recruiting more than 100 staff members in Hong Kong. In mainland China, it plans to add 1,000 employees this year, and a similar number next year. Bank of New York Mellon recently announced it would increase its 150-strong Hong Kong staff by another 50 as part of its expansion in Asia. And ANZ of Australia, which recently bought some Asian operations from Royal Bank of Scotland, the battered British lender, is hiring 100 senior private bankers in the region over the next 18 months. Several others, including Citigroup, Nomura, Barclays Capital, Credit Suisse and BNP Paribas, have announced new hires and appointments in recent weeks. Tales like these highlight the newfound dynamism that is starting to creep back into the Asian job market. While unemployment continues to rise in much of Europe and is expected to top 10 percent in the United States before any improvement materializes, rates in Asia have remained relatively low: 5.4 percent in Hong Kong and 3.3. percent in Singapore. One relatively weak spot is Japan. The jobless rate hit a seasonally adjusted 5.7 percent in July, the highest level since the end of World War II and up from 5.4 percent in June. But elsewhere, recruitment firms are busy again. Andrea Williams, managing director of Ambition, a headhunting firm in Hong Kong, said that things started to turn noticeably from April onward. 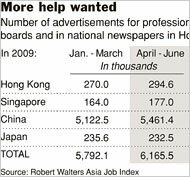 A survey in August by Robert Walters, a recruiting firm based in Singapore, showed that job ads in the Hong Kong, Singapore, Chinese and Japanese media nudged up 6.4 percent in the April-to-June quarter from the previous three months. Of course, for the legions of those who lost their jobs and still remain unemployed, or who are still being laid off as some companies continue to struggle, it is too early to celebrate. “It’s not an across-the-board improvement — it’s pretty patchy in terms of sectors, and in terms of geographies — but things are at least holding steady or even getting better in some parts,” said Darryl Green, who heads Asia Pacific and Middle East operations for Manpower, a temporary employment and recruiting company. Nearly all of the jobs that are coming back are “replacements” of previously cut positions, not new jobs, market experts here say. And employers are still being very cautious and choosy when it comes to hiring. But increasingly, the champagne is coming back out, as Asia’s economies and stock markets are recovering — faster than expected, and faster than Europe and America. Demand in the financial sector is strongest for back-office positions like compliance and accounting, as well as client relationship and asset management — a business in which many banks want to expand to tap the growing number of increasingly wealthy Asian savers. Outside the financial sector, there is anecdotal evidence of hiring in other areas, though it is patchy. Demand for sales jobs, for example, has picked up across all sectors as companies focus their still scarce resources on jobs they hope will help generate immediate revenues. In Hong Kong, Eike Croucher, a communications manager, was laid off from Swiss Re after the reinsurance company announced in April that it would shed 10 percent of its 11,500-strong global work force. Mrs. Croucher had a job offer from the German chemicals giant BASF on the evening of her last day at Swiss Re, thanks to some fast networking. “I was very, very lucky, of course, that things happened so quickly,” she said. In another example, one senior marketing executive who lost her Singapore-based job with a large U.S. software company, had been in the region for four years. The woman, who spoke on condition of anonymity because she was not authorized to talk to the media, found a job at another U.S. company in the same sector. It took 7 weeks of research, 45 applications and a dozen job interviews. It is still very much an employers’ market. Generous “expat packages” — in which overseas employees have much of their housing and their kids’ schooling paid for — are for many a thing of the past. The most successful candidates have experience in Asia, a network of contacts and language skills. It is difficult for someone to just pack up and move over from New York or London, where the market remains much gloomier. In fact, many recruiters are already starting to warn that a “talent crunch” could be only months away, with companies again struggling to find people with the right combination of international qualifications, contacts and languages — of which there is a limited supply. One piece of advice for job seekers, though easier said than done: “Learn Mandarin,” Mr. Carriban said. Singapore faces the spectre of rising long-term structural unemployment as the economy recovers from the global financial crisis. Structural unemployment occurs when the skills of workers do not meet the needs of employers. With certain sectors such as manufacturing and electronics lagging behind, Singapore workers will have to be retrained to be employable in new industries such as the gambling industry. The government’s timely interventions in the form of job credit scheme has helped to keep retrenchments and unemployments to a minimum and lessen the impact of the recession. However, some workers may find their life-long skills and expertise redundant in a different economic climate blighted by the relentless influx of cheap, foreign labor. Latest data showed that the number of people unemployed for more than 25 weeks is rising. Official estimates put the rate of long-term unemployment among residents in Singapore at 0.8 per cent as of March this year, up from 0.4 per cent last year. With no retrenchment benefits or minimum wage to safeguard the interest of workers, they will have to constantly upgrade themselves to stay irrelevant in Singapore’s competitive labor market. The blue-collar workers will be hardest hit as their jobs, which are labor-intensive in nature can easily be taken up by foreigners willing to work for longer hours at lower pay. Foreign workers make up almost a third of the population and their increasing numbers have led to concerns and angst among the locals. Despite the prevailing sentiments on the ground that there are too many foreigners living and working on the island, the government shows no signs of reneging on its pro-foreigner policy to cut back on the numbers. Foreigners drive up the prices of HDB flats which hit a peak lately. Still, the government insists that HDB flats remain “affordable” as Singaporeans use less than 30 per cent of their monthly pay to finance the mortage loan. In view of the uncertainty ahead, Singaporeans should think twice before committing themselves to a long-term financial liability. Nobody is guaranteed a job for life in Singapore and one can find himself replaced by a foreigner the next day suddenly without prior warning. According to Total Alternatives, Hari Kumar, co-founder of Singapore-based LionRock Capital, has begun approaching investors for its recently launched LionRock Master Fund. The multi-strategy fund launched on June 15 with $75 million of partners’ capital, but now Kumar, along with co-founders Ben Freischmidt and Julian Snaiph, are approaching family offices, endowments and funds of funds. The capacity is $1 billion. From FINalternatives, news of the build up of hedge fund platforms in Singapore and in Hong Kong. As the Asian hedge fund industry rises from the ashes of last year’s huge losses and huge redemptions, a number of Korean financial services firms are hoping to play middleman in the resurgent space. Kookmin Bank, Industrial Bank of Korea, Samsung Securities and Woori Investment & Securities have earmarked more than US$1 billion to build up hedge fund platforms for institutional investors, Asian Investor reports. Woori and Samsung have set up their platforms in Singapore, while Kookmin has opted for Asia’s hedge fund capital, Hong Kong. Hwang Sung-ho, CEO of Woori I&S, said the firm’s platform is small, but that it is investing substantial resources into building it up. The firm hopes it will be the centerpiece of a multi-asset strategy group. Woori is also creating a hedge fund index, AI reports. We are looking for Quant Interns to come to Singapore. We provide R/T ticket – accomodation and living allowance for 12 month and the possibility of joining the team after that. This is for a joint venture between a singaporean university and a North American hedge fund to research Risk Analysis in derivative portfolios. From Asian Investor, news of Roger Lee, the previous head of Nikko Asset Management’s Singapore office, who has joined Tarascon Capital, a Hong Kong-based hedge fund. Tarascon was established in March 2007 by Jonathan Iu, its CIO, to manage an Asia-Pacific equity long/short strategy, with Morgan Stanley as its prime broker. The fund was a rare success story in 2008, gaining 7% when most other long/short strategies in the region were losing money. Tarascon now manages around $30 million on behalf of individuals and US-based funds of funds. Iu is keen to build on last year’s success but realised the need to augment his small team of three, which includes a head of research and an operations and administration specialist. Lee has 16 years in the funds industry. Prior to Nikko AM, where he handled business development for Asia ex-Japan, he worked at a number of other investment firms. These include SBC Brinson/UBS Asset Management, Dresdner Private Banking, Allianz Asset Management and Columbia Management, the funds arm of Bank of America. Following Lee’s departure from Nikko Asset Management, the firm has appointed Ng Soo-nam to run the Singapore business.